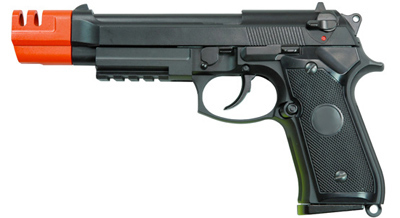 The TSD M9 is the perfect gun for reliability, quality, performance, and practicality. This gun can shoot with green gas or propane. The high capacity magazine holds 25 rounds. 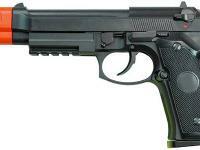 The TSD M9's plastic body and metal parts add to the realistic look and feel of this pistol. Metal parts include: magazine, accessory rail, inner barrel, hammer, slide catch. The price for this gun is just unbelievable. Included: gun, magazine, speed loader.